Azaleas and rhododendrons are popular landscaping and ornamental species in the western counties of North Carolina. Landscapers and growers note a steady demand for these plants but have traditionally relied on native stock, which is cut back and dug from the wild and relocated to their farms for management. Species such as flame azalea (Rhododendron calendulaceum), pinkshell azalea (Rhododendron vaseyi), red laurel (Rhododendron catawbiense), and punctatum (Rhododendron carolinianum) are becoming increasingly difficult to find in the wild due to extensive harvesting of native rootstock for ornamental sale. By collecting and propagating these species from seed, these harder-to-find species can be successfully cultivated on-farm. This type of “conservation through propagation” approach can reduce pressure on wild populations of these native ornamentals and provide viable and healthy stock of these plants. In addition, while Fraser fir production and tobacco remain the most popular agricultural endeavors in the county, many growers are interested in the production of other viable alternative cultivars. Participating growers intend on propagating rhododendrons and azaleas in their greenhouses as well as seasonal plants such as poinsettias to complement their Fraser fir Christmas trees. Due to the popularity of native plants for area landscaping, demand for these types of plants is high. Currently, Fraser fir and other tree species for landscaping are the only crops cultivated on the farms participating in this project. Both farms are interested in diversifying their production to reduce risk, increase on-farm income by producing a shorter-term product, and to effectively use land that is not in production or not viable for production of traditional crops. In the fall of 2003, seeds of several species of native rhododendron and azalea were collected from a variety of local sources. The participating growers utilized funding to erect greenhouses and propagated seed in domed propagation trays with appropriate soil and media. Seedlings will be transferred in the field and/or into pots after the first year. The structures completed with grant funding consist of a 14 x 24 shade house and a 18 x 48 Gothic style greenhouse with roll up sides. Both structures have a 6-inch gravel floor over landscape cloth. The ends of the green house are insulated for winter, as are the sidewalls. Heated benches consist of 4 4×8 benches constructed from treated lumber with wire mesh bottoms, and 3 inches pea gravel into which is embedded plastic water pipe. Heating is accomplished by means of water being pumped through a 50 gal gas hot water heater into the benches. The secondary heating system consists of a fabricated hot air system. Hot water is pumped through an automotive air conditioning condenser and is radiated by a fan. Plants consist of seedlings and rootings of popular and unusual houseplants and trees, ground covers, native plants and shrubs, perennials, and hanging baskets. Annuals will be started in March. Potted Vasyei azaleas acquired through Project Branchout are being hardened off in the shadehouse for sale in Summer 2005. The Grant covered about 25% of the initial cost of the project. The Bradley’s purchased and erected a greenhouse from Farm Wholesale Products measuring 8′ W x 8′ L x 8′ 9″ H. It is made entirely of 3.5 mm Solexx Panels. Flame Azalea. and Sweet Azalea. In May 2004 plants were moved to a cold frame on their property. In July, trays were transplanted to cups and averaged 250 plants of each variety. In September 2004, plants were transplanted to larger cups. Due to illness in the family they lost a lot of plants due to drying out. They lost all Punctatum, Sweet Az. and many of the Vaseyi. However, they transplanted about 125 Flame Azalea to the field in October to the field to harden off for the winter. 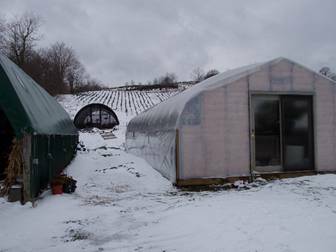 The greenhouse was also used to produce tomatoes and okra in early spring that were transplanted to the field after the last frost. The greenhouse production at the Maram farm is expected to complement their agritourism objectives for their existing operation by providing year-round plant sales of native rhododendrons and azaleas and seasonal ornamentals such as poinsettias during Choose-and-Cut season. The Bradley’s intend on propagating azalea and rhododendron species to complement their existing production of landscaping perennials by growing bare root B&B plants.